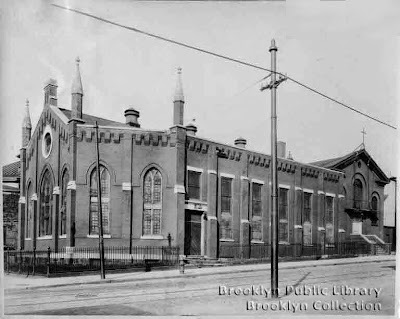 The 59th Street Lutheran Brethren Church, between Seventh and Eighth, has been located in Sunset Park since 1929, and has been a church community since 1912. Today it holds services in both English & Chinese. 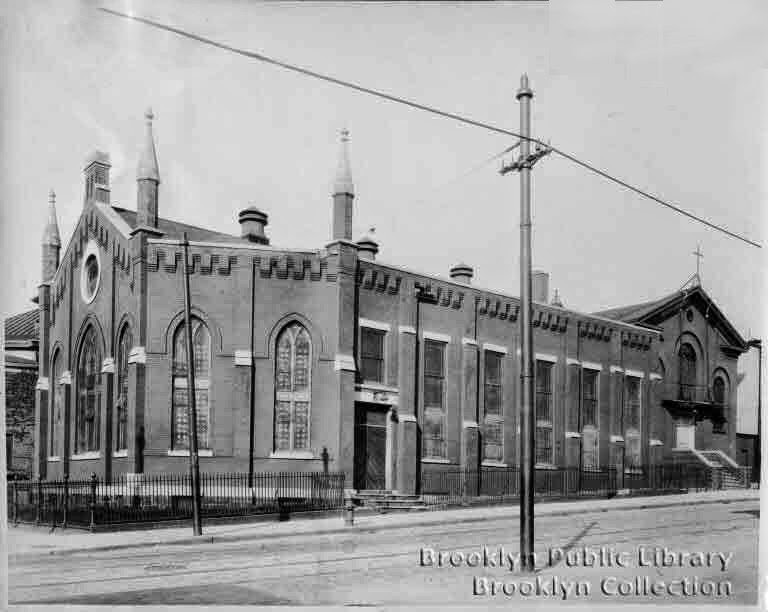 Before it was at 59th, its Norwegian congregation worshipped at Fourth & 15th St., in a church building vacated by the Greenwood Baptist Church, which moved to Seventh Avenue & 6th Street. I'm not religious, but the stories of these churches fascinate me, especially the church hopping that still goes on all over the city, when the demographics of neighborhoods change, when immigrant populations arrive, establish themselves, grow and prosper, or fade. When younger generations lose their faith or move away. Dutch, German, English, Norwegian, Spanish, Chinese, Korean. Church to temple, Catholic to Baptist. Believers, inhabiting each other's spaces in turn, or joining together to keep at least some of the older, frailer parishes alive. I was sure there was no church still standing at the Fourth & 15th corner, but I was curious to find out more about it. According to the New York City Chapter of the American Guild of Organists - an invaluable resource - it was founded in 1874. After the Norwegian congregation went south, to Sunset Park, the church was taken over by the Holy Trinity Armenian Church, the first Armenian church in Brooklyn. When did its final congregation leave? There was no mention. But the NYC AGO did reveal that much of the church structure still remained, as part of ... the Strauss Auto Center! I know the corner only too well, but had never realized that part of a church was in hiding there. I walked over today, to take a look, and just in time, it seemed, as scaffolding was going up for demolition work. Here was the main body of the church, for perhaps a day or two longer. I wondered if any religious detail remained inside, and if any of the workers knew what they were about to tear apart. The Greenwood Baptist Church began as a mission school, established in the fall of 1855 by the Rev. Henry Brownley, a missionary appointed by the Tabernacle Baptist Church. In 1856, the mission school was extended so as to include Gowanus. On September 28, 1858, the Greenwood Baptist Church was organized in Mechanics Hall at the corner of 18th Street and Third Avenue. In 1863, the cornerstone was laid for a brick chapel, measuring 35 by 75 feet, that was erected on 15th Street, near Fourth Avenue. The chapel cost $11,000 and was dedicated on April 26th that same year. Over the next decade the society grew and prospered, and on August 4, 1874, the cornerstone was laid for a new church building on the corner of Fourth Avenue and 15th Street. Described in The New York Times(Aug. 5, 1874) as "a plain but commodious structure," the church was to be of red brick trimmed with Cornet stone, and would measure 74 feet by 81 feet. The audience room would be 70 feet by 72 feet and would provide ample accomodations for 900 persons. No account has been found of the dedication, but the new church was to open by Christmas Day, and was not expected to cost more than $30,000. Nothing much to distinguish it from a warehouse now, and no trace at all of the chapel. Luxury rentals rising soon.